Many, many years ago when I lived in Germany a French friend honored me with the privilege of accompanying him and his friends on a truffle hunt. I had been intrigued by the mystery and mystique surrounding this prized and elusive fungus which grows underground. After years of pestering him to join a hunt, he finally issued an invitation, but only on the condition that I would tell no one of the location where we would conduct the secret search. We were in northern France near the River Meuse where Regis, my friend, had a friend who supposedly frequently found truffles in the forest. We set off into the woods, basket and a tool for digging in hand. It was snowing. It was freezing cold. Truffle season is from November through March. We started in an area of thick brush at the edge of the forest where a type of nut tree grew. We were told to look for a patch under the tree with no vegetation. Truffles grow near the roots, depleting the soil of nourishment so other plants cannot grow on the spot. We found many such spots and began digging, combing, sifting through the icy ground. And so it went, for hours it seemed. I kept unearthing blackened, semi-decayed acorns, worms and roots — but nary a "black diamond," as truffles are called. None of the others hit pay dirt either. Darkness approached. The cold pierced my fingers like tiny needles. I was beginning to think it was all a hoax. The hunt ended sans truffles, but to reassure me that they really do find truffles, Regis' friend invited us back to his home where he proudly displayed a large jar filled with the knobby fungi. And, his wife prepared a delicious chicken dinner with truffles. 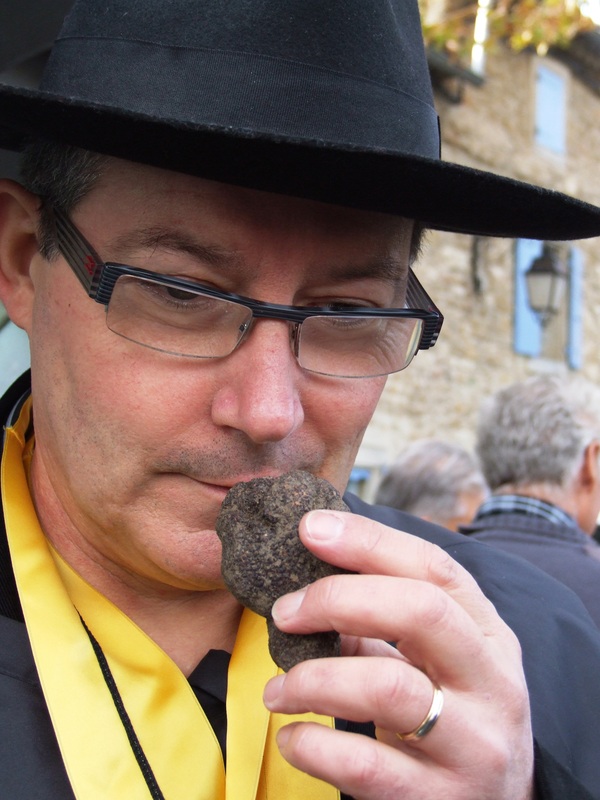 I am still in awe of truffle mystique, and now I live in southern France where precious truffles are big business. 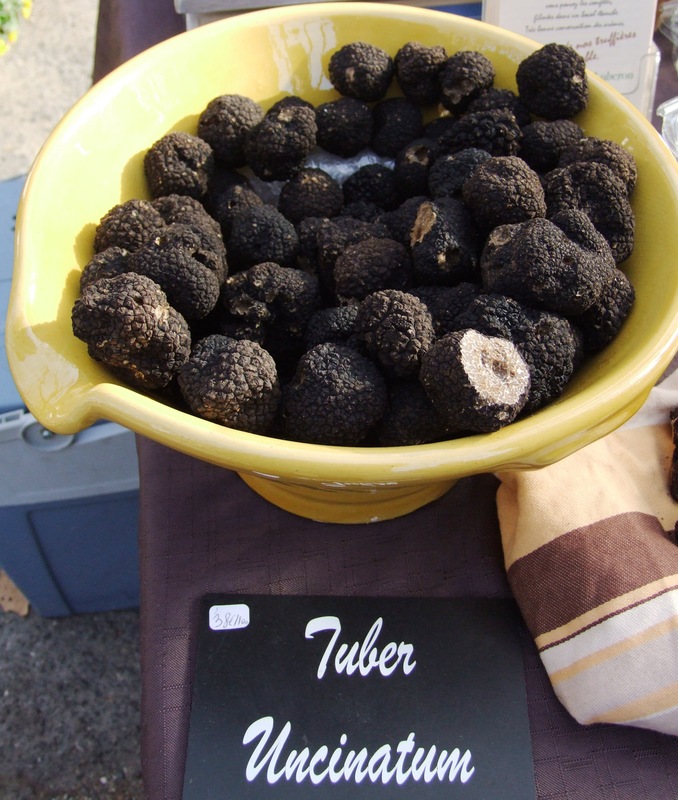 Truffle markets and truffle festivals abound. There are even truffle masses where the earth's sacred treasure is blessed. Those in the truffle business belong to an exclusive "confrerie." 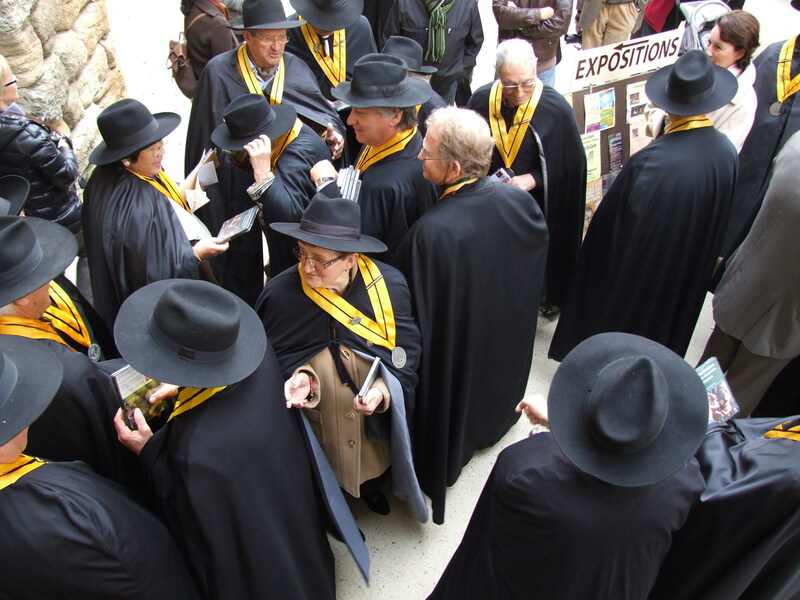 They turn up at festivities wearing their "uniform"– long black robes with huge medallions hanging from yellow ribbons around their necks topped off with broad rimmed black hats. Consumers spend lavishly on the cherished delicacy, and restaurants charge dearly for dishes graced with this culinary gem. I was thrilled with a recent invitation to join a truffle weekend with French journalists in Richerenches, a small town known to have the largest truffle market in the country. Truffles have traditionally been associated with Perigord in southwest France, but we were in southeast France. In fact the Porsche of truffles (there are several varieties) is known as the Perigord truffle, but it is cultivated in these parts where farmers plant acres of oak trees which are excellent truffle hosts. Nonetheless the next day at the truffle market there was plenty of buying and selling of black diamonds. This market is primarily for professionals. Growers come with sacks of the treasure and make the rounds of the buyers to see who will offer the best price. The latter set up shop under their car trunk hoods or the back of vans where they have a small scale to weigh the merchandise. They hold the truffles up to their nose for a whiff of the strong scent, examine the fungi carefully, often scratching the surface to check the interior color. The darker the color, the more flavor the truffle will have. It's all shrouded in secrecy. The buyers and sellers want no photographs. Most did not want to talk to journalists. It is said they fear thieves. No doubt that's not all they fear. 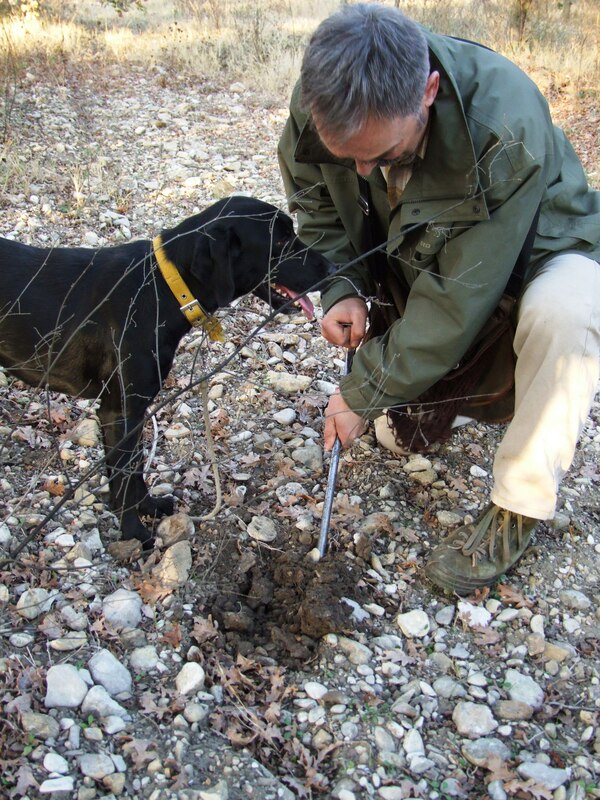 A sizeable quantity of truffles is worth thousands of euros, and truffle theft is a big problem. 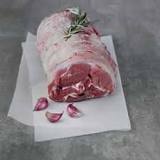 At this market the going rate was between 150 and 230 euros ($225 – $345) per kilo (2.2 lbs. ), but throughout the season the price will fluctuate depending on quantity and quality of available truffles. After lunch in a crowded community hall — truffle omelet — we set off to a truffle farm where we accompanied Christian Allegre and his dog Chou Chou, a small, sleek, speedy black Labrador, into the fields where oak trees grew. "The dog is the master. We follow him," Allegre said. Chou Chou went crazy, running madly from tree to tree, sniffing the ground, then often furiously digging. Allegre was quick on the spot, rewarding Chou Chou with a treat. The lively canine let him take over the digging with his truffle tool. He did uncover truffles, not on every spot, but frequently. Allegre told us about the trees, truffles, dogs — and thieves. The latter are known to come to truffle farms at night early in the season after a rain, marking bare spots where the earth is raised indicating a truffle is growing underneath. They return later — also at night — to unearth and carry off the riches. The best and biggest truffles are found after a full moon, Allegre said. Labradors make excellent truffle dogs because they are "calm, gourmands and attached to their master," he explained. Pigs were once used to sniff out the fungi, but they are too big and they can be mean. As to the trees, they must grow for eight years before their roots will nourish truffles. Why he is enamored of the black diamond? "It's magic. It's mysterious. It's a product of deception." Our truffle ramblings ended with a taste of truffle ice cream prepared by a noted pastry chef: creamy vanilla with black specks of truffle that was surprisingly good. Click on the photo of truffles in the Photo Album for more photos.